Mt. 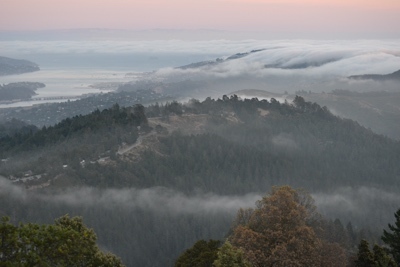 Tamalpais is an iconic mountain in Marin County, offering varied trails, rich history, and stunning views down onto the bay, San Francisco and the East Bay, Marin County, and the Pacific Ocean. A special way to enjoy the mountain and its surrounding beauty is on an easy-to-moderate 4-mile evening hike, watching the sky change as daylight turns to moonlight and city lights below and stars above begin to twinkle. We'll hike from the Mountain Home Inn to the historic West Point Inn, have a dinner picnic with a lovely view during sunset, and then hike the same route back. Please note: This hike will begin in daylight and end in the dark. Total hiking time, excluding the picnic, will be 2.5 to 3 hours. The latter half of the hike will be in dusk and then true darkness. On this date, the moon will rise before the sun sets, so if it's not cloudy, we should have plentiful moonlight; still, we encourage you not to come if you do not feel comfortable being outdoors in the dark. And please do bring a flashlight! Additional Information: We will start our hike from the parking lot directly across from the Mountain Home Inn on the Panoramic Highway. This is a small lot in a popular park, so parking may fill up. We thus strongly encourage carpooling, which can be done from the strip mall parking lot at Tamalpais Valley Junction (where Highway 1 takes a sharp left-turn). To do so, please sign up at http://www.groupcarpool.com/t/pmhogv. Layers; much of this hike goes through a warm pocket of air in which short sleeves may be comfortable, but the end of it is typically chilly enough for a fleece or jacket.